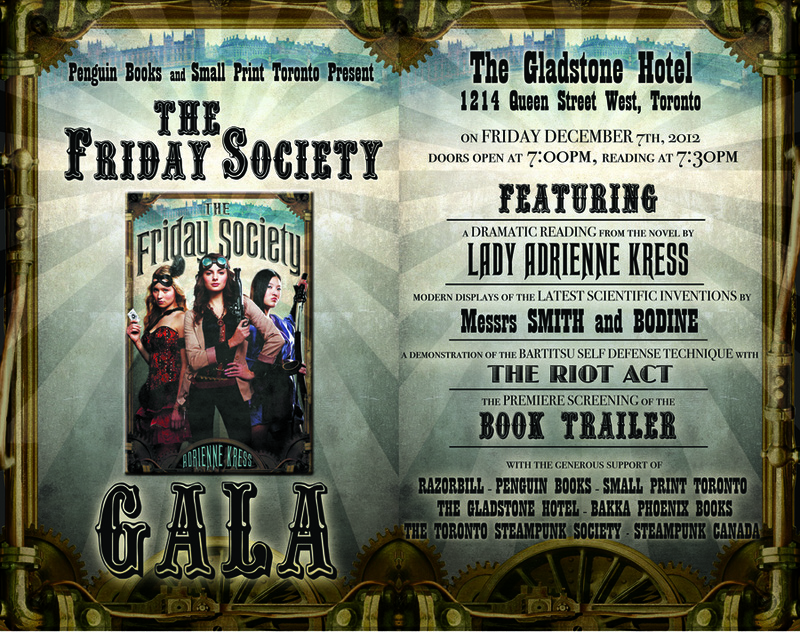 The Temp, The Actress and The Writer: The Friday Society Book Launch Info! 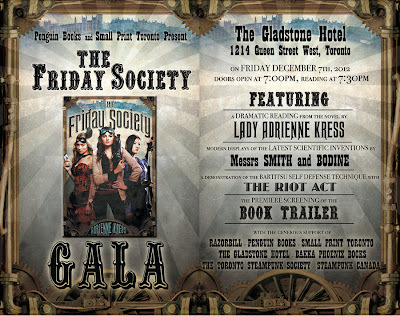 The Friday Society Book Launch Info! So it has finally been decided and the book launch for THE FRIDAY SOCIETY will be . . .
December 7th, 2012 at The Gladstone Hotel (doors open at 7pm and reading is at 7:30pm). And all of this so wouldn't be possible without the help of the amazing Chris Reed at Small Print Toronto and Adam Smith from Steampunk Canada (oh, and I guess Penguin Books have kind of sort of been awesome too). These two gents have helped me find a venue space and book acts, and let me tell you, it is going to be a FANTASTIC evening. We'll have a demonstration of Bartitsu (the first mixed martial arts technique, invented by Sir Edward Barton Wright back at the turn of the century - uh, not the most recent turn, the one before that) by members of the incredible stunt team Riot A.C.T. We'll also have some amazing Steampunk props/inventions on display courtesy of Mr. Smith himself and R. Phinius Bodine. The book trailer will have its premiere public screening, and of course, I, Adrienne Kress, will be doing a reading. Dress in your Steampunk finest (or whatever you feel like, but know you won't be out of place either dressed up all Steampunky, nor will you be the only one in street clothes), and be prepared for a delightful time. Also all ages are welcome! Can't wait! I've put it in my calender.